Gmail labs offer the extra functionality by adding extra features to accounts. It’s a great way to make your works easier & simpler by adding extra functionality. Google Gmail lab is the experimental add-ons before its release to all users. 2018 Gmail labs have some best excellent add-on like Custom keyboard shortcuts, read mails right next to your mail, pre-written email text. If you’re not using it though, now is a great time to start. Before using Gmail labs you must enable this feature. Click on the Gear icon present at the top right. Click on Enable radio button to activate specific lab. Canned Responses are pre-written common messages that speed up email writing and long repeated response which is frequently used such as Thanks for your Feedback. Before Using, Canned Response makes sure to enable this lab, Just go to Setting>labs>enable Canned Response and save changes. Open compose window. Type the message that you want as Canned Response. Click on the arrow button appear at the bottom right of the compose window. Select the canned response then click on “New Canned Response” and enter the Canned Response name. Click Ok and now you are done to use this feature. To use Canned Response. click on the arrow button appear at the bottom right of the compose window. 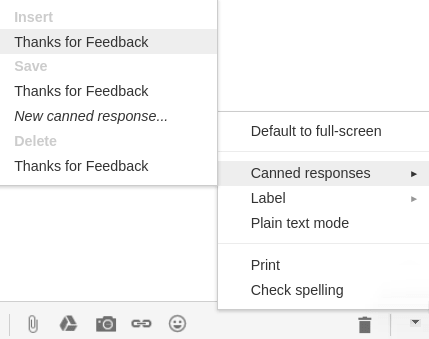 Select the canned response from a menu and select canned response which you want to use. Multiple Inboxes categorized your emails by creating custom inboxes on your Gmail home screen. This makes it is easier to see all email at once place. custom inboxes can be labels, your starred messages, drafts. you can customized numbers of boxes to display at home screen. 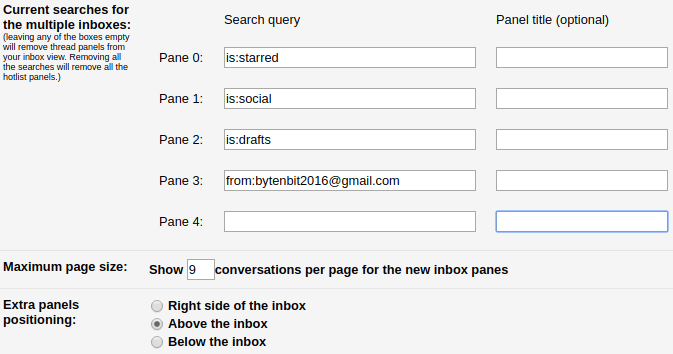 Before using, Multiple Inboxes make sure to disable all the tabs from Configure Inbox. 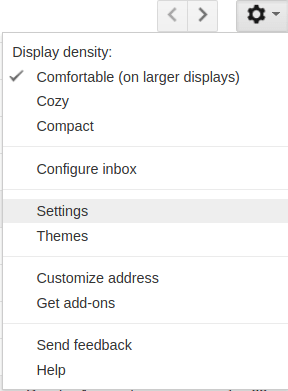 Maximum 5 Custom Inbox can be displayed at a time. 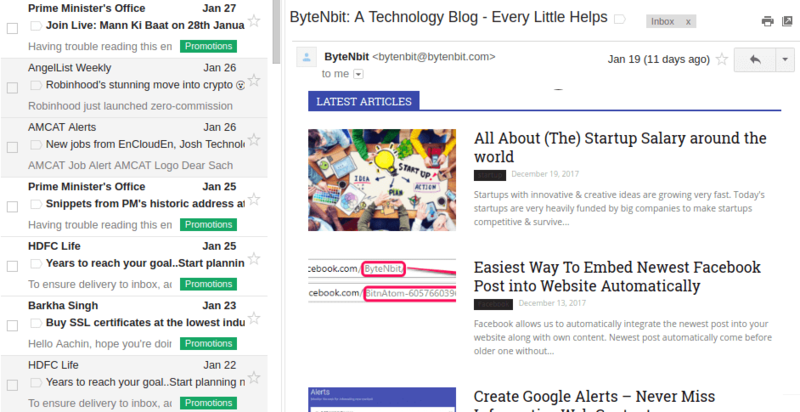 This feature helps you to read emails right next to your mail, without leaving home page. It makes an easier to read all your mail by splitting screen into two pieces, one for browse mail and another screen for reading email. This saves the time to go back to lookup mail. Steps to use, Just go to Setting>labs>enable Preview pane and save changes after enabling Preview pane, a button will appear at top right of your inbox. User can select from option of how preview pane split screen Vertical or Horizontal Split. Nothing is more powerful than working with shortcuts. it saves times, gives much better result to speed up your work. 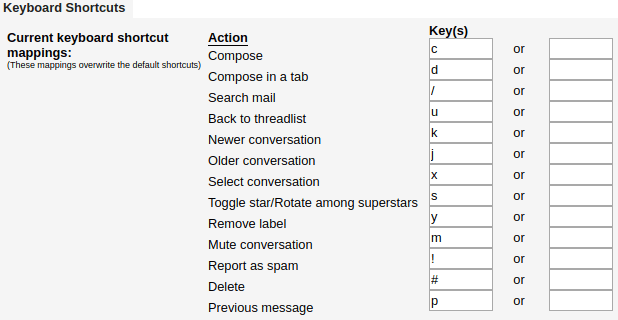 User can customize shortcut with any key. To enable this lab, go to Setting>labs & and click on enable Custom keyboard shortcuts and save changes. After enabling the lab, Go to the General Tab from Setting, Turn on the Keyboard shortcut on and save the changes. To Customize the shortcuts go the Keyboard Shortcuts tab and change shortcuts according to need. Press Shift +? to see more shortcut. 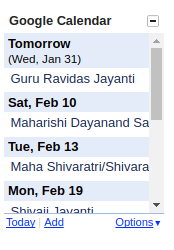 Adds a calendar box which displays all upcoming events, locations, and details in left side of Gmail inbox. To enable this add-on, go to Setting>labs & enable Google Calendar gadget and save changes. After that, In the bottom left click on the three dots to open the calendar widget. These three dots work like toggle button on clicking, calendar widget will disappear or appear. Smartlabels will be shown under the “Categories” section in left side. 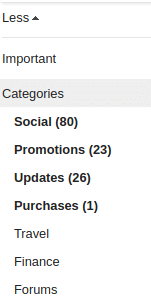 To turn on/off the specific categories, Go to settings>labels under categories click on show or hide. Automatically shows the next conversation instead of your inbox after you delete, archive, or mute a conversation. You can select whether to advance to the next or previous conversation in the “General” Settings page. 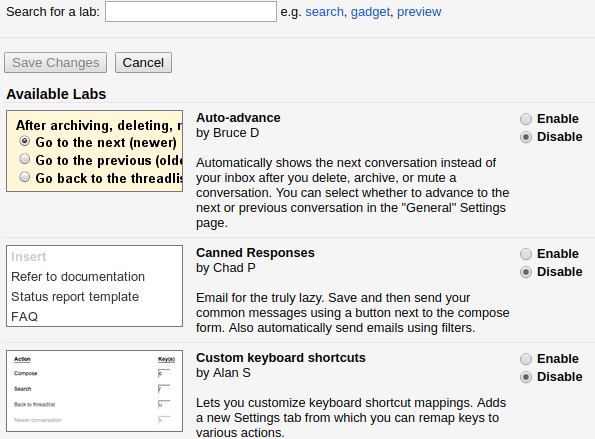 Google Gmail Labs is a testing ground for experimental features. According to Gmail this lab can disappear or break at any time without any notification.